Great macro for blending between 2 and 3 colors based on shapes size, distance from a point, vertical or horizontal position, or stacking order. Also adds the ability to label your colors. You can easily make color swatches between colors to get just the right color needed. Many user friendly and helpful options make this macro a very powerful tool that can be used in many creative ways! This macro includes a free bonus macro GDG Randomize-A-Tron. The ultimate macro for randomizing shapes fill colors, outline colors, outline widths, size, rotation, skew, and position. 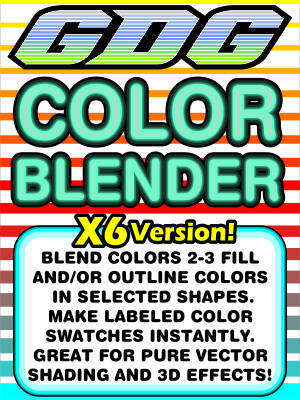 The most fun you'll ever have with a CorelDraw macro! Note: This macro is the X6 version. If you need the X4/X5 version you can find it in the X4/X5 macros section.